ChemLINE® 2400 ES (Elevated Service) is an abrasion resistant heat cured polymer lining system. ChemLINE® 2400 ES is a tough, flexible lining designed to handle the abrasiveness of coal, ore, plastic pellets and other media up to 400°F (204°C). ChemLINE® 2400 ES has excellent chemical resistance capable of withstanding the corrosive attack that normally comes with media handled. Sulfuric acid to 98%, most solvents including methylene chloride, MEK, methanol, gasohol, distilled water, inorganic acids, dilute organic acids and alkalis. Ideal for corrosive vapor environments. customer service. Contact +01 440-937-6218. 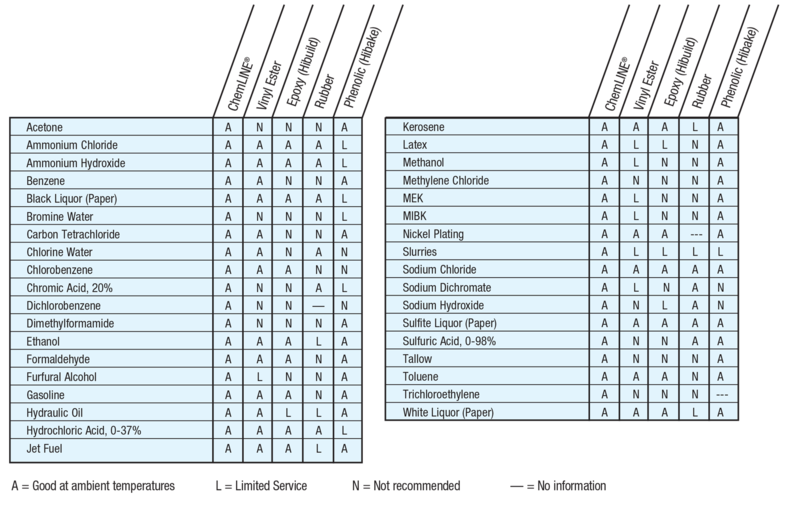 See the APC Chemical Resistance Tables for more complete chemical listings. This is an abbreviated listing of the more than 5,000 chemicals that have been tested. This information is intended to serve as a reference guide only. The end user is responsible for determining if ChemLINE® is the appropriate coating for the specific application involved. Contact your ChemLINE® Representative or the ChemLINE® Customer Service Hotline +01 440-937-6218 for detailed specifications prior to any final coatings recommendation or application.